If you wish to keep your Open Table invoices from continuing to rise, it helps to understand the intricacies of their business model. Open Table entered the market with software that helped restaurants manage their customers more efficiently. Initially their pricing model was negligible compared to the value of their software as their fees were tied to their booking community, which was relatively small in the beginning. As their booking community grew their invoices naturally got higher. Plus Open Table began introducing ways to generate higher profits from their booking community. Today many restaurants feel trapped in the Open Table monopoly. They are frustrated they are paying so much, but scared to leave them. Reservation Genie believes restaurants will have to invest in a reservation model with a free booking community or resign themselves to paying more per cover over time. Open Table pricing model starts with a $1,295 hardware fee that is frequently negotiated lower. It also includes a monthly fee of $199 per month and $99 to be listed in their private dining program. Then they include per person (cover) fees of 25 cents per cover booked for reservations that originated from the restaurant’s website, $1 per cover for reservations that originated from Open Table website, and $1 per person for reservations originating from partner sites like Yelp and Trip Advisor. The most expensive element for those who use it is the $7.50 per person they charge restaurants looking to fill empty tables using their 1000 point table program (POP Tables). Open Table benefits by getting more people to skip the restaurant’s website entirely and book directly through Open Table. They even offer an incentive to do so by giving customers 100 points they can redeem for gift certificates that they do not receive if they book directly from the restaurant’s website. Getting customers to book through their site directly enables them to steer customers towards 1000 point tables and rake in even higher profits while simultaneously making their monopoly stronger. Open Table benefits by getting more people to skip the restaurant’s website entirely and book directly through Open Table. There they can steer customers towards 1000 point tables and rake in even higher profits while simultaneously making their monopoly stronger. The solution is to drive as many people as possible to book directly through your website where they will cost less than booking directly through the Open Table website. If you use Reservation Genie to manage reservations from your website, it will eliminate cover fees from regular customers as we do not charge for covers booked from the restaurant’s website or people who return to book directly from ours in the future. Here are some tips to driving more reservations through these paths. Widgets are small snippets of code from other websites that you insert into your own website. While having an Open Table widget on your homepage will help people find reservations quickly, a reservations link in your main navigation should get them there easily as well. You should offer both options for maximum results. If that reservations link is pointed at an actual reservations page as opposed to a section of your homepage hidden by Flash or Jquery, it helps Google index that page and include it in their search results. This can lead to more people booking through your website. To illustrate this in effect, we will use a couple of our New York clients, Remi and Cellini. 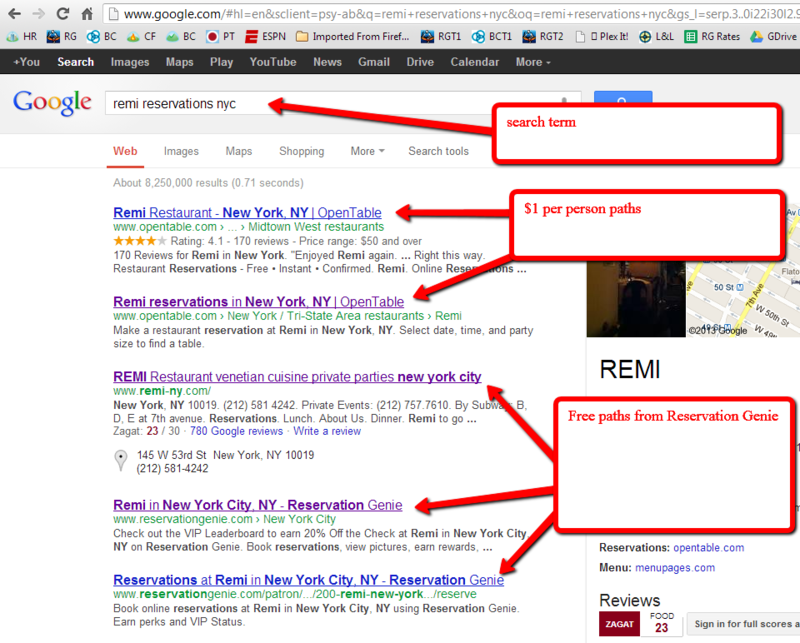 Google the term “Remi Reservations NYC” and you should see Open Table links listed above Remi’s website. Remi has a flash site which stores all the pages inside one file on the homepage and prevents Google from indexing an actual reservations page. Consequently the first 2 search results are Open Table pages that represent a more expensive cost per cover. Results 3, 4, and 5 are free paths as they lead to Reservation Genie. 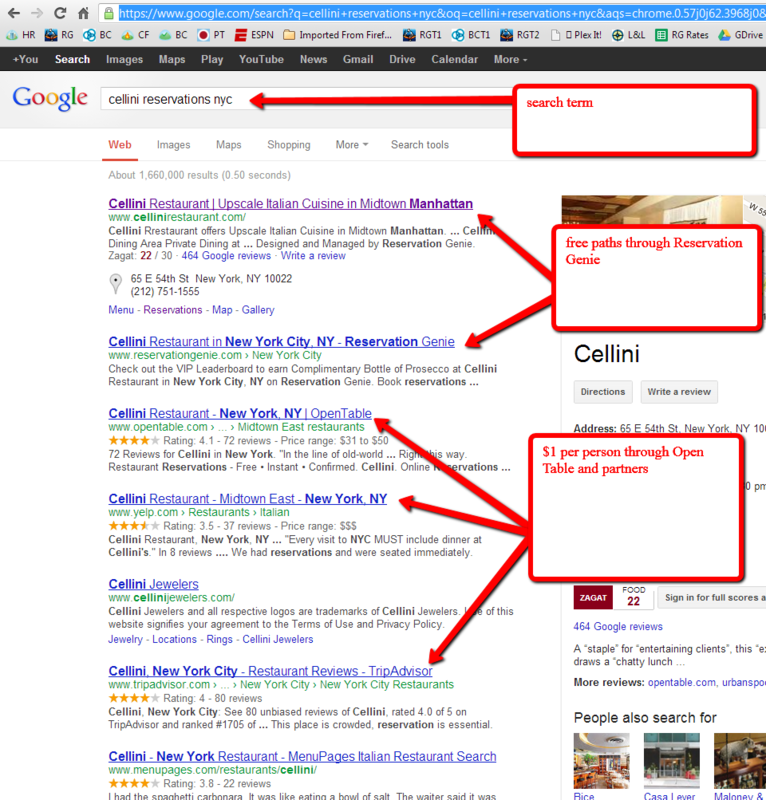 Next Google “Cellini Reservations NYC” and notice the results shown here. They have a properly search engine optimized Reservations page. Consequently the first two results are free paths and the more expensive paths are options are pushed down to results 3, 4, 6, and 8. In this step we’ll extend the subject of search engine optimization and how it can influence your reservations in another way. Search engine optimizing your site is fairly easy. It requires you create an easy to read website structure and add good meta tag data for each page in your site. Reservation Genie always designs websites with search engine optimization in mind. We specifically target 6 pages for indexing to achieve a well-organized Google 6 Pack, a set of 6 sub pages shown in Google’s search engine results for “branded searches” that usually include the restaurant name and city such as “cellini restaurant nyc.” These should be your primary pages: menus, map, contact, reservations, gallery, and about us or private dining (if the restaurant offers it). Searching engine optimizing each page with coordinated page name, inbound link, Meta title, and Meta description is all you need to do. If your site is search engine optimized and organized like Cellini, you will get the Google 6 Pack with one entry in the 6 pack being your reservations page shown highlighted in the graphic below. 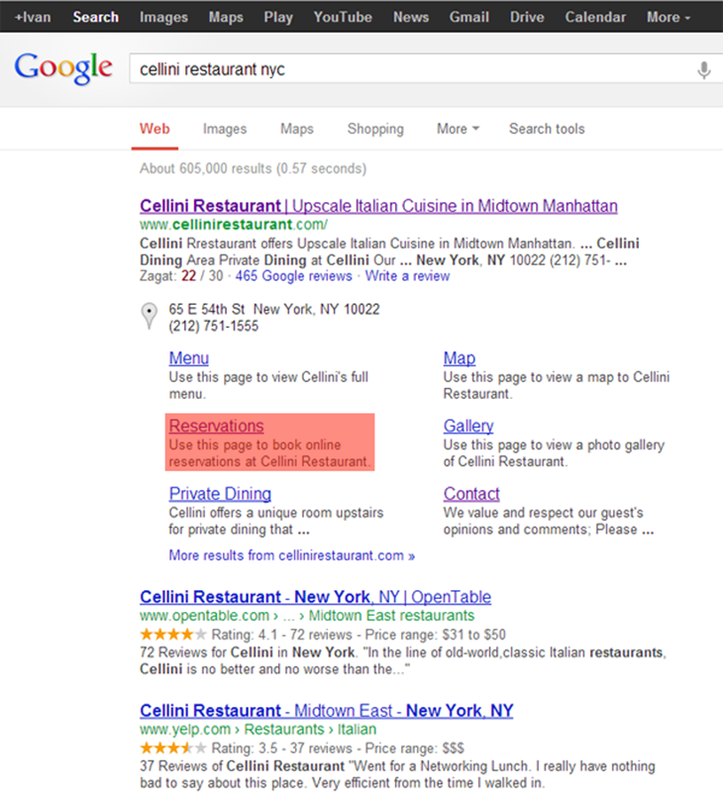 Achieving the 6 pack gives your restaurant more screen real estate in Google Search results. This pushes paths to more expensive cover fees from Yelp and Open Table profiles lower down the screen where they are less likely to be chosen. Plus if you have a properly search engine optimized reservations page, it generates a quick short cut to this option for people simply looking to book a reservation at your restaurant. That means 25 cents per cover instead of $1 per cover if you only use Open Table. And free reservations if you use Reservation Genie. Labeled a yield management tool, 1000 point tables enable restaurants to drive traffic to off peak hour to maximize the yield of their tables. Yield management can be effective marketing tool and both Reservation Genie and Rez Book offer yield management tools. The difference is that ours don’t cost $7.50 per person. Reservation Genie enables restaurants to offer custom perks that fit their brand such as complimentary appetizer per 2 entrees, 10% off the check, of 50% off bottles of wine with the purchase on an entree. A complimentary appetizer may have a perceived value of $10 to the customer, but really only cost the restaurant $3 in food costs. Reservation Genie is completely transparent with the source of all their reservations and separates patron reservations from concierge reservations. Open Table’s lack of transparency in this area can cause problems if you manage a concierge referral program on the side. Concierges may encourage customers to choose 1000 point tables and collect the $10 in gift certificates as a reward. As a restaurant you can’t see that concierges are booking 1000 point tables as the source of 1000 point tables is difficult to find. Restaurants that have incentive programs to reward concierges for their referrals and use 1000 point tables are subject to paying twice. You pay once in the incentive to the concierge and then again as a cover fee for the 1000 point table. We know this occurs as we cater to concierges and they tell us that they prefer to book 1000 point tables when they are available because it pays more. If you’re determined to use 1000 point tables, you can minimize the instances of double paying, by promoting a concierge contest in Reservation Genie. As a restaurant you can’t see that concierges are booking 1000 point tables as the source of 1000 point tables is not easily ascertained. Restaurants that have incentive programs to reward concierges for their referrals and use 1000 point tables are subject to paying twice. If you’re dead set on using 1000 point tables and use Reservation Genie, you can minimize the chances of double paying by setting up a Reservation Genie concierge contest. Simply require that all concierge referrals go through Big Concierge (the concierge version of Reservation Genie). There you can reward them with bonuses that are more profitable for them than a 1000 point table. For example, a $5 bonus per cover in gift cards is greater than or equal to what they would receive on Open Table by booking a 1000 point table. For a party of 2 it is equal to the Open Table bonus. For parties of 3 or more it is greater than the Open Table 1000 point tables. Yet, at $5 per person it’s always lower than the $7.50 per cover Open Table charges. You can also set up the concierge contest to reward prizes for reaching booking thresholds such as $100 gift card for every 25 people you send. Focus on something that rewards concierges more than 1000 point tables and costs less while factoring in your average party size. As mentioned above, Reservation Genie lets you configure customized perks for your customers and attach them to times you’d like to encourage customers to book (yield management). You can also offer them for coming back often (loyalty program). If your perks have a perceived value of more than $10 per reservation and cost you less than $7.50 per cover, then it’s a better deal for both your restaurant and your customers than a 1000 point table. What you offer depends on your menu prices. A complimentary appetizer per reservation may be worth more than $10 to the customer and still cost you less than $7.50 per person in food costs. Ten percent off the check may also meet the requirements if your PPA is sufficiently high. We recommend 10% off the check for off peak hour perks and 20% off the check for VIP (loyalty) perks. In general, the more compelling the VIP perk the more successful your VIP program. If you need help with search engine optimization for the Google 6 Pack or would simply like us to review your website and Open Table strategy to see if we can spot areas for optimization, please do reach out.